Both Andersons win in Brisbane! Gary and Kyle Anderson won through to the quarter-finals of the first ever Brisbane Darts Masters. But there was disappointment for Team Unicorn stablemate Michael Smith, who was sent packing on Friday night at the BCEC. It was a big performance from Kyle Anderson, who has been struggling all year with diabetes related problems which have affected his vision. By the way, there will be a big interview with Kyle coming very soon on the website. Watch this space! From 1-2 down against fellow Aussie Barry Gardner, Kyle produced arguably his best five straight legs of darts in months. He hit six perfect darts in one leg, produced some terrific finishing, two 11 dart legs and four 180s in all as he raced to a 6-2 victory and will now face Michael van Gerwen. Gary was made to scrap again by Aussie Damon Heta. The Unicorn man was coasting at 3-0 and was sat on 32 to make it 4-0 before Heta took out a series of finishes, including a superb 152 to force a deciding leg. 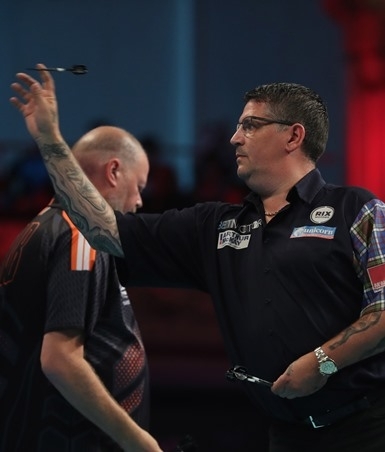 Anderson though held firm to set up a clash with Raymond van Barneveld. 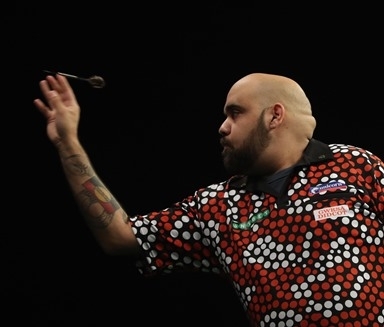 But for Michael Smith, the World Series roadshow ended with a heavy defeat against Australian Raymond Smith. The Unicorn ace just never got going after his opponent took out 125 in the opening leg and then raced into a 5-0 lead.